Please feel free to talk to Karen Bishop or call the church office 780-428-1818 with any questions or concerns regarding the renovation process. Posted June 2017 - The removal of the scaffolding marks the end of Phase 1 of the restoration of McDougall Church. The project began in July 2016 and was completed 11 months later. The building’s iconic towers and the front of the church have been cleaned, bricks refurbished and cornices replaced and repaired. As additional funding becomes available, we will complete the north and east facades and then begin upgrading the interior. The project was funded by the Province of Alberta, the City of Edmonton and McDougall United Church. The Province spent $750,000, the City of Edmonton spent $500,000 and McDougall Church spent $100,000. We want to thank our partners, Ledcor, Group 2, and Next Architecture, as well as sub-contractors and consultants. 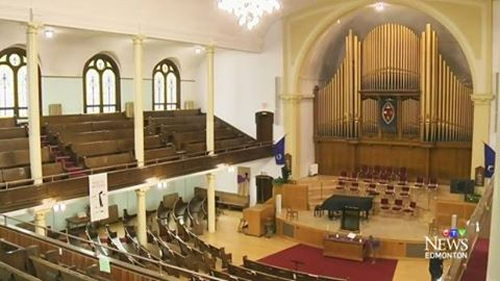 The Church was declared a Provincial Historic Resource in April 2015, and a Municipal Historic Resource in 2016, and remains a facility for the entire Edmonton Community. Recent community events include the Edmonton International Choral Festival hosted by Pro Coro Canada on June 2-4 with venues throughout the city. McDougall Church will open its doors from July 2-4 as part of the Edmonton Historical Society’s Historic Festival and Doors Open event. It is also a designated tour site for the Downtown Business Association’s downtown summer walking tours hosted by their Core Crew guides. Posted October 20, 2016- The hoarding on the south tower scaffolding is 50 per cent complete. It will be heated so that work can continue even during the cold weather. Repairs on the north stair concrete began late this week, as well as repairs to the south tower roofing. Wood replacement is required on the south tower louvers. The heat provided by Ledcor will allow tradespeople to continue stripping and painting the windows and louvers. Concrete repairs for the south stairs are complete. Next steps will involve repairs for the north stairs and main entrance stairs (a slip-resistant coating will be applied). Additionally, the masons have started repairs to the arch. Regarding the cornice, anti-pigeon measures will be added after the restoration has been completed. winter. Work on the roof will start next week -thankfully it will not be affected by the weather. The early arrival of cold temperatures and snow mean that tarps and heating systems will be installed in areas around the windows on the North tower and surrounding the concrete work. It is yet to be determined as to when the exterior bricks will be washed, as special care is needed to prevent freezing. The same applies to cleanup on the West facade and the South tower due to the fact paint stripper does not work under cold conditions. A special thanks to Gerald Watts for bringing us up to speed on the restoration work each week. Posted October 7, 2016 - Thank you to everyone who came out to the McDougall Community Mural project last Sunday. The Edmonton Journal and Metro News stopped by, and we had more than 40 people drop in to paint their McDougall love on the wooden hoarding. Looks amazing! In other news, masonry on the North Tower is complete and we are half-way there on the West Façade. The contractors are working hard to match colours on the replacement bricks in order to maintain colour continuity. The entrance sign will be removed between Oct. 17 - 20 and replaced at the end of the month. The southwest stairs have been reinforced to repair structural cracks and are in the process of curing It’s hard to believe we have come so far already!! Posted September 29, 2016 - We are well underway in completing Phase One of the restoration process. We are so very thankful for all the people involved in making sure our church is restored and repaired with the utmost care. The North tower has been cleaned and re-pointed and is almost complete, and currently the masons are now working on the South tower. The cornice is in storage and will be evaluated to determine what can be reused. We have received final quotes for painting, woodwork and roofing and are in the process of going over the pricing to determine next steps. Preparation for the painting of the hoarding is in progress. The painting will take place on Sunday, October 2 and we hope to see you there. Various approvals from the Province have been received or are in progress. – so far there are no hold-ups, and for this we are very thankful. Posted September 22, 2016 - Want to share your love for McDougall with the rest of the city? The McDougall Restoration Committee cordially invites all members of the congregation to join us on Sunday, October 2 from 12-4 for a community mural project. Together with the Group of Some paint group and members of the public, we will turn the wooden hoarding lining the church outside into a beautiful painted mural. We are asking the congregation to bring paintbrushes and leftover cans October 29 to be added to our supplies so we can cover the walls with colour. Haven’t painted in years? Not to worry! This is a fun, collaborative event with supplies and assistance for all. We hope you will join us for this project. A light lunch will be provided. Posted September 8, 2016 - As you can see outside, construction at McDougall is well underway. We know that change is not always easy, but it can be a time of reflection and reimagining. Every time you see the safety nets and scaffolding, try and remember that they are part of the Renaissance that will enable the church to serve the community for many more decades to come. Sharing our story with the community is another way, and the Restoration Committee is delighted that one of our members, Winston Pei will be presenting a lecture called How to Accidentally Help Save a Heritage Building at the Pecha Kucha event Sept.29 at the Garneau Theatre (7-9pm).We invite you to come out and hear his take on the important role McDougall plays in the locals arts scene. Posted September 1, 2016 - Restoring a church like McDougall is not just a one person job and we are lucky to have an expert team of architects, engineers, historians, masons, contractors and committee members ensuring all aspects of the church are treated with care. Nothing has been removed or repaired without careful consideration. It has been determined that the west faced and two towers require brickwork restoration. The bell tower cornice will be removed and cataloged until it can be determined how much will be salvaged. Also be prepared for the installation of wooden walls where the safety fence was to protect pedestrians as we move into the Fall. Posted August 26, 2016 - What a beautiful sight to see our church moving forward into the future! Scaffolding along the west façade has been installed, as well as along the south bell tower. During an inspection of the coping on the bell tower, it came to light that humans are not the only ones in love with our church! Large quantities of pigeon nesting and droppings were found inside and below the cornice and must be removed in order to dismantle the bell tower cornice. Luckily we have some of the best professionals in the city on the job! Posted August 11, 2016 - Scaffolding continues to go up along the west and south west facades. Covered walkways were also installed to protect the comfort and safety of pedestrian traffic. A team of architects and contractors will be inspecting the cornices to determine best preservation methods, and concrete work continues on the exterior stairs. These are exciting times for this historic, landmark building in our community. Posted August 4, 2016 - The community continues to be informed about the restoration process, highlighting McDougall’s place as an important landmark heritage building in the city. On August 8, contractors and architects arrive to inspect the cornices on the south tower to determine the best process to preserve the integrity and historical value of these features. A covered walkway will also go up next week to protect pedestrian traffic. July 27, 2016 - Repairs to McDougall United Church began on July 25, 2016 and will continue into the fall. This restoration project was made possible by a total of $1.25 million dollars in grants provided by the Province of Alberta and the City of Edmonton. Phase One of the project includes reconstruction of the front stairs and repairs to the brickwork on the façade of the west side of the building. Maintenance and repairs to the south tower will also take place. 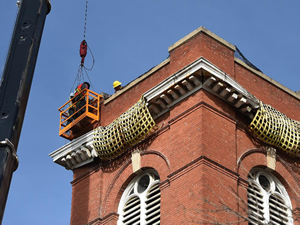 Scaffolding has been erected around the perimeter of the church, and a number of trees on the south side of the building had to be removed, as it was determined they would not survive the restoration process. Posted December 2015 - Upgrades have begun on the roof of the McDougall Church annex. The 1954 annex structure is not officially part of the historic church building but is vital to building operations, as it contains the church office as well as rehearsal space and change rooms for various events and productions put on by the many building users, including choirs and other performers. The repair is being funded by the McDougall United Church congregation as part of its ongoing 100-year commitment to maintaining the buildings. Work is expected to be mostly completed by Christmas. We have been sharing our love for McDougall with the rest of the city!!! 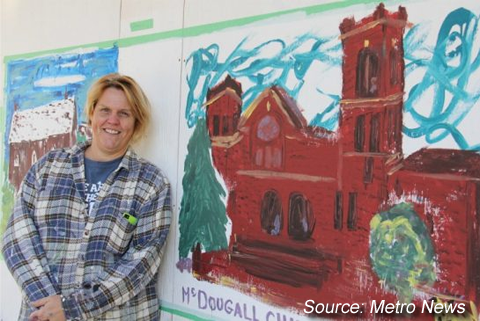 The Restoration Committee invited the public to be part of painting a community mural on the wood panels lining the pedestrian walkways outside the building to express gratitude and celebrate McDougall’s history as a church, community hub and arts venue! Come check them out when you are in the neighborhood! 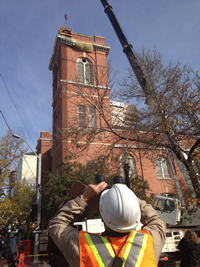 A crane arrived at McDougall United Church, heralding the beginning of repairs to the exterior of our 100-year-old building. Initial work is planned for the cornices of the South Tower, which are protected with nylon netting and will remain, and be made safe before the snow flies. The Province has committed – and now provided! - $750,000 in funds for renovation. Further work will start in the spring. This temporary support will allow us to properly plan the cornice work in conjunction with the brick, window and woodwork restoration. The congregation of McDougall United Church accepted designation as a Provincial Historic Resource in the spring and expect a similar civic designation soon. It is our hope this designation will protect the building for the continued use of all Edmontonians into the future. McDougall is committed to work with the City, the Province and with our many supporters and stakeholders to restore one of Edmonton’s most significant historic buildings and to make it safe and useable for its next hundred years. The process has begun to hire a Project Manager and appropriate architects and engineers to provide guidance through the project. Fundraising efforts are ongoing and active. The City of Edmonton has committed $500,000. McDougall has applied for funding from the Government of Canada through the federal government’s Canada 150 program. 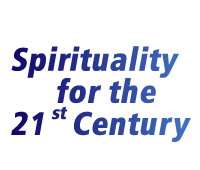 The congregation of McDougall continues to fund ongoing maintenance and solicit donations for capital projects. Outside groups are working to raise funds as well. These include Friends of McDougall and its associated groups, including choirs and music organizations and all who value the building as a historic resource for all Edmontonians. 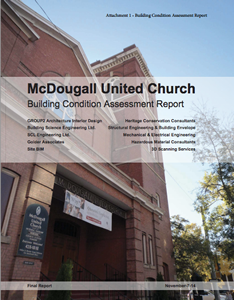 On April 1, 2015, with the support of the McDougall United Church council, trustees, Edmonton Presbytery and Friends of McDougall, Culture Minister Maureen Kubinec announced her intent to seek provincial heritage status for the McDougall church building. With designation will come the Government of Alberta’s generous contribution of $750,000 towards the restoration of the building. The City of Edmonton, represented by Councillor Scott McKeen, has identified a possible further $500,000 for a total of $1.25M. Minister Kubinec will formally publish her government’s intent in the Alberta Gazette. That will trigger a 60 day review period for comments and questions. At the end of that period, and with the approval of McDougall United Church and the Edmonton Presbytery, the McDougall building will become a provincial historic resource. McDougall is an important historical building, artistic, cultural and concert venue, and place of worship. The Church Council has endorsed Friends of McDougall and commits to working with this arms-length group towards the goal of preservation of this historic building. 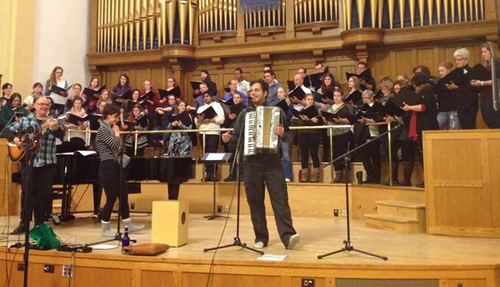 Friends of McDougall is a group of community leaders, preservationists, performing arts supporters and advocates, formed to preserve the historic McDougall Church building and protect its important role as a premier downtown Edmonton performance and community space. raise funds to restore the building. For more information on Friends of McDougall and how you can become involved, please visit their website. McDougall United Church has a Building Fund, separate from the day-to-day operations. Contributions to this fund are eligible for a tax receipt and will only be used for building restoration. For further information on how you can contribute, call 780-428-1818. 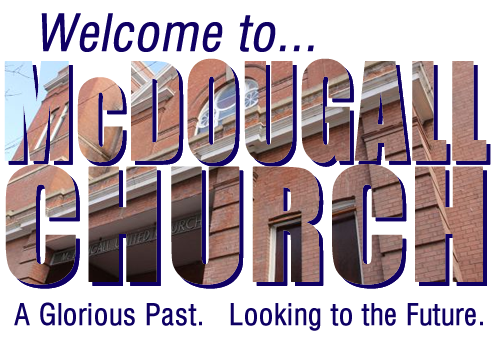 If you do not wish to go through the Church, the citizens’ group called Friends of McDougall has been formed. It is not affiliated with the Church. It also issues tax receipts. For further information on how you can contribute, please visit their website. This page is an archive of information regarding Phase One of McDougall's Restoration. This phase was focused on the restoration and preservation of the church's facade, roof and bell tower and it was completed in June 2017. For information about the on-going Restoration Campaign, please visit Restoration Phase 2.